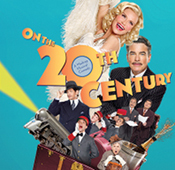 On the Twentieth Century – Tony and Drama Desk award-winner Kristin Chenoweth will finally disembark in New York when On the Twentieth Century closes this weekend on July 19. This catchy, silly romp on a train, which also features the stunningly talented Peter Gallagher, is filled with musical richesse from Cy Coleman, Betty Comden and Adolph Green. www.roundabouttheatre.org. American Airlines Theatre, 227 West 42nd Street. Fish in the Dark – Larry David’s kooky family comedy has the kind of outrageousness you’d find on his TV show. The lead is now played by Seinfeld and Broadway veteran Jason Alexander, and you have just a few more days to see it as it closes July 18. www.fishinthedark.com. Cort Theatre, 138 West 48th Street. An Act of God – What could be more intriguing than having Sheldon (Big Bang Theory) play the role of God on Broadway? Jim Parsons embodies the divine as he explains creation. Adding to the irreverence, the show takes place at the former Studio 54 disco. Closing August 2. www.anactofgod.com. Studio 54, 254 West 54th Street. It Shoulda Been You – Surprising twists, laughs, and witty dialogue are all in this no-intermission musical about two dysfunctional and disparate families. If you saw the Tonys, you know how talented Lisa Howard is and you won’t want to miss her star turn here. Closing August 9. www.itshouldabeenyou.com. Brooks Atkinson Theatre, 256 West 47th Street. Mamma Mia – Come on, you know you can’t resist dancing to Abba’s catchy tunes. Maybe you’ve even since this show once, but the time to get tickets is coming to an end. Closing September 12, Mamma Mia has been entertaining Broadway audiences since 2001. Which one’s her dad? You won’t ever know unless you see the play. www.mammamianorthamerica.com. Broadhurst Theatre, 236 West 44th Street. This entry was posted on Wednesday, July 15th, 2015 at 11:08 pm	and is filed under Stuff to Do. You can follow any responses to this entry through the RSS 2.0 feed. You can leave a response, or trackback from your own site.